Activists have launched a new round in their long-running campaign to restore Yosemite National Park's Hetch Hetchy Valley to its natural condition by draining the reservoir that serves San Francisco and most of the Peninsula. In a lawsuit filed last week in Tuolumne County (embedded below), the group Restore Hetch Hetchy renews arguments that featured prominently in a 2012 San Francisco ballot campaign -- namely, that the water supply from San Francisco's Sierra Nevada reservoir can be readily and relatively cheaply replaced by altering management of the Tuolumne River. San Francisco officials, who have opposed studying the idea of emptying Hetch Hetchy, say the suit is "baseless" and that even suggesting draining the reservoir -- as the state contends with a severe drought -- is "outrageous" and "crazy." 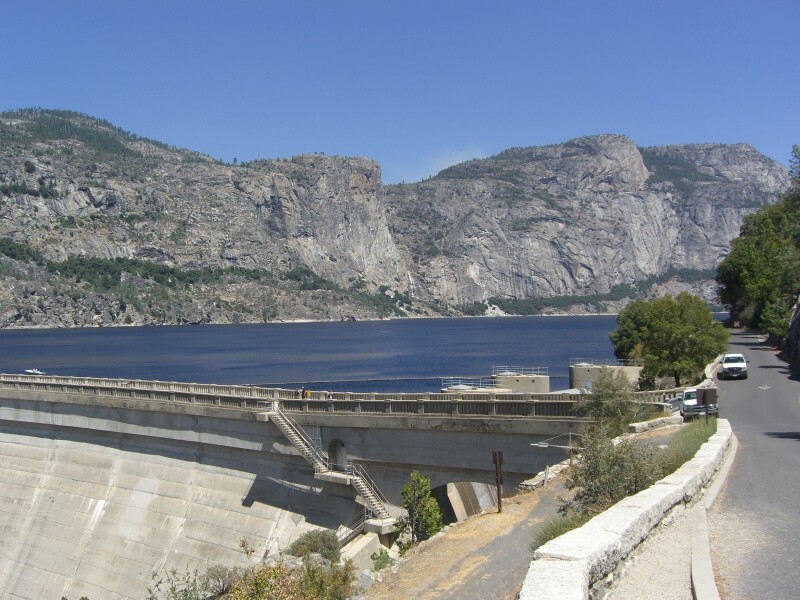 The lawsuit alleges that Hetch Hetchy violates a 1928 provision of the California Constitution that requires the "beneficial and reasonable" use of the state's water. The action points to later interpretations of the provision, Article X, Section 2, which have held that "the public interest requires that there be the greatest number of beneficial uses which the supply [of water] can yield. [The city has] eliminated or seriously impaired the beneficial uses of the Tuolumne River as the river flows through the Hetch Hetchy Valley. Respondents’ method of diverting the Tuolumne River’s waters eliminates important aesthetic, scenic, fish & wildlife habitat, fishing, recreational, and preservational beneficial uses in furtherance of water supply storage for remote cities and replaceable electric power production. The suit also says the city's water project robs Yosemite visitors "of the wonder that would be experienced by millions ... journeying to view Hetch Hetchy Valley's sublime landscape." The suit uses an approach similar to the one that Restore Hetch Hetchy employed in 2012 as part of its campaign to pass Proposition F in San Francisco. The measure would have required the city to undertake a study of draining Hetch Hetchy and reconfiguring the system that delivers water from the Tuolumne watershed to the city and Peninsula. The suit asks for a court order requiring the city to "prepare an engineering and financing plan for altering" the Hetch Hetchy system. Prop. F went down to a resounding defeat, with a 77 percent "no vote." "This is just another attempt to grab the spotlight on an issue where we're talking about taking the water supply away for a large part of California," said Tyrone Jue, spokesman for the San Francisco Public Utilities Commission, which runs the Hetch Hetchy system. Jue repeated the city's talking points in fighting the 2012 ballot measure: The Hetch Hetchy system is efficient, it delivers pure mountain water and does it inexpensively while producing clean hydroelectric power. As city officials have said for years, he added that the cost of restoring Hetch Hetchy would be prohibitive. "It was estimated to be between $3 billion and $10 billion in investment to remove Hetch Hetchy Reservoir and restore the valley," Jue said. "And if you put that cost on each customer, that's a range of approximately $550 per year to $2,000 per year if San Franciscans were to have to pay that cost." But the lawsuit argues that a restored Hetch Hetchy Valley would become a magnet for visitors and become an economic engine generating as much as $8.7 billion in recreational benefits to visitors and local businesses for the first half-century after restoration. "We intend to show that the value of a restored valley is greater than the cost of restoring it," said Spreck Rosekrans, Restore Hetch Hetchy's executive director. And Rosekrans said the process of restoration would itself be a magnet for future visitors. "You would have tourists going to see this marvelous place almost immediately," he said. "People would come back every five years, every 10 years with their families, with their kids, and it would be a really incredible thing to watch this valley come back to life."